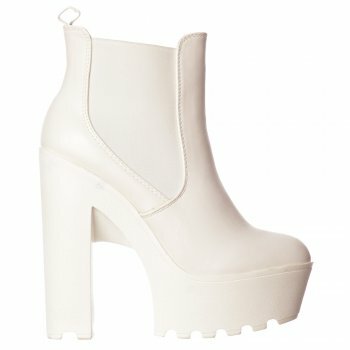 Cause A Sensation in These Eye-Catching, Jaw Dropping Classic Chelsea Boots With a Modern Twist! Featuring a Towering 5.75 inch Chunky Cleated Sole Block Heel with 1.75 inch Platform They Really Are The Finishing Touch For Any Outfit. Elasticated Sides and Pull on Tab for Easy On/Off. Choice of Black or White.